Nintendo Labo VR KIT combines the innovative physical and digital gameplay of Nintendo Labo with basic VR technology to create a simple and shareable virtual reality experience for kids and families. Nintendo Labo VR comes in a variety of different SKUs to let the player get the complete kit at once or get it piece meal as desired. This complete set comes with everything included for the full Labo VR experience. 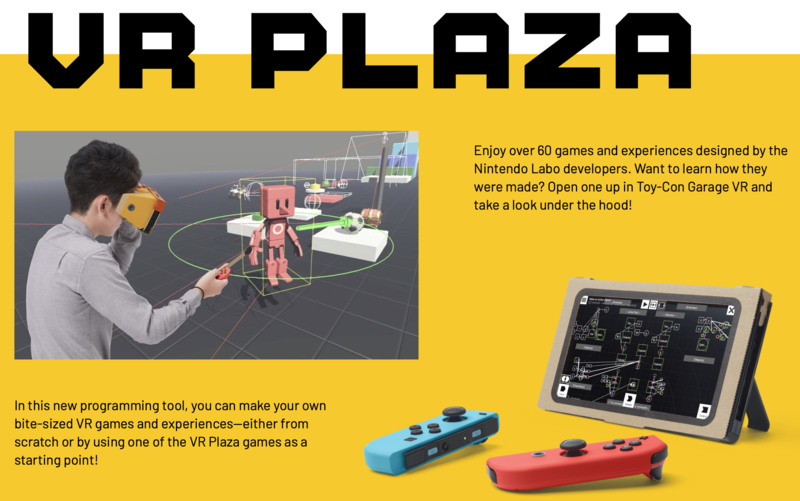 It includes the 6 Labo VR Toy-Con projects: Toy-Con VR Goggles, Toy-Con Blaster, Toy-Con Camera, Toy-Con Bird, Toy-Con Wind Pedal and Toy-Con Elephant. Also included, a Screen Holder and Safety Cap. For those who don't want to splurge right away, you can handily get the Starter Set + Blaster first and enjoy the basic Labo VR experience, and you can pick up the expansions later if you wish to. This expansion for the Starter Set + Blaster includes the Toy-Con Elephant and Toy-Con Camera. This expansion for the Starter Set + Blaster includes the Toy-Con Wind Pedal and Toy-Con Bird. With Labo VR, you can also learn and create. How long do each of the Toycon builds take? What are the technical specs of the Switch? I heard it's not suited for VR. The Switch screen is 720p with a 60Hz refresh rate. The resolution is just below that of PSVR as well as most mobile VR, while being most comparable to the latter. While that is considered low, and below what many consider the minimum requirements for suitable VR, Nintendo has been able to mitigate most of the biggest fears related to low-performance VR, such as motion sickness. For most, this means that the screen will appear a bit blurry with a noticeable "screen door effect", meaning the separation between individual pixels is pronounced enough to be noticeable, appearing like a mesh screen door over the image. Most have reported that the refresh rate does not cause sickness or discomfort, but moving your head at a fast rate does create a "motion blur" effect, so rather than creating a delayed image that may create a disconnect between what you see and where you feel you should be looking, you will get an image that looks a little smeared. While the effect may not be desirable, when compared to the alternative of potentially provoking discomfort and motion sickness, the end result is that the game is still playable without the unfortunate physical side effects. Motion sickness in VR is a very individual experience that varies from person to person and from game to game. If you know you have any propensity for motion sickness, you may want to take as much caution with this as any other VR experience. Nintendo recommends taking breaks and only playing for a few minutes at a time. Most of the Labo VR experiences are very gentle and don't have much movement that you aren't in control of. The sweet spot for the lenses are pretty big without very strong magnification so even the act of just looking through the lenses to stare at a screen is less likely to cause strain and discomfort. Even the act of holding up the goggles to your face creates an amount of disconnect from the immersion that makes you aware you aren't in the virtual world, which may also help to mitigate potential motion sickness. There has been at least one person reporting a immediate feeling of discomfort, which they have said was helped by removing their screen protector, although it is unclear if this was the cause of their discomfort since others have also mentioned no noticeable change or distortion of their experience caused by their own screen protectors. Ultimately, people have different eyes and different physiology that will create scenarios where some are more susceptible to motion sickness than others, and even then some experiences can allow the discomfort to subside as you get used to it, but it's up to you to decide if a VR experience is right for you. For those living in the United States and wish to try it out Labo VR for themselves, Best Buy is having a Labo VR demo in-store on April 14th from 11am-2pm local time (check stores for details). Is Labo VR "real VR"? Labo VR does not offer the same positional tracking of your body that other VR like PSVR, HTC Vive, or Oculus Rift does. It does have rotational tracking for your head like mobile VR such as Google Cardboard and GearVR offers allowing for a more limited VR experience, but with a similar 3D stereoscopic view of a virtual world. Does Labo VR have 6 Degrees of Freedom? 6 degrees of freedom in VR refers to tracking along 3 positional axes and 3 rotational axes. Other high-end VR often offers 6 DoF tracking, but Labo only offers 3 DoF. Although the Elephant Toycon expansion does allow for 6 DoF controller tracking in relation to your 3 DoF head tracking, which means you are able to draw in 3D space, but with only 3 DoF head tracking, you aren't able to lean and look around your drawing. Is there any way to put on a strap? It does not come with a strap nor are there any signs of a way to attach a strap in the future nor is there an official strap attachment announced. The holes on the side of the goggles are grommets and washers used to attach the lenses to the carboard and not actually holes. Although in true DIY fashion, some have already built their own straps to use their goggles like a headset, but it will need to be something to make yourself. Can you use the Labo VR goggles with headphones? Yes, there are cut outs for the headphone jack and the volume controls when the Switch is in the goggles. The sound is also audible when in the goggles without headphones as well since there are small cut outs about where the speakers are in the front of the Switch. Does it work with glasses? Yes, there is enough space for glasses. Do you need to have the Joycons attached to the console to have gyro tracking? No, there are gyroscopes and accelerometers built into the Switch console itself. How many Labo VR games are compatible with each Toycon? The camera, the elephant, and the blaster Toycon each have 2 bigger game experiences a piece. The Bird and Wind Pedal are the exception since they have one game each, as well the game Bird Dash which uses both the Bird and Wind Pedal Toycon together. Are all the VR Plaza mini games compatible with the Starter Kit? No, there 48 VR Plaza games compatible with just the Starter Kit. 4 for the Blaster, 4 for the Pinwheel, and 38 that use some the goggles alone, usually with a detached Joycon. Finally, 8 of the games are made to show what types of non-VR games you can make with the new VR Garage. How many VR Plaza games are compatible with each expansion? The Elephant has 4 VR Plaza games and the Camera has 4 as well. The Bird and Wind Pedal also are compatible with 4 each. Is there any other VR content included? There are 33 short videos to give you a taste of stereoscopic 180 degree video shot for VR. Is there any way to share games made in VR Garage? No, there is no online sharing or any other functionality currently in the game that allows any type of sharing of the games you create yourself. I can't find any of the Expansion Kits in-store? Where else can I buy them? Is there any way to replace torn or broken cardboard parts? Labo VR support is coming to Super Mario Odyssey and The Legend of Zelda: Breath of the Wild with a software update on April 25th. No hands-on or reviews yet! Credit to takoyaki and mazi for providing some of the review links. Got the full set coming today and I feel like a child at Christmas. Labo is just so satisfying and fun to build, and this looks to be the best Labo yet. Apologies for the thread title. Didn't have time to pick this up today since work is running late so I'll try tomorrow instead. Super excited after all the positive impressions! Very good OP! Can't wait to try porting Teleroboxer to the Garage. Will probably get the base kit plus the camera kit, I have some extra points, so they will only cost me around 48 euros. Thanks guys, it's my first OT and it was on a bit of a short notice so it was intense! I'll update it as necessary. Including prices for UK and Japan. Just finished building my goggles, will build the blaster when I have more time later. Works surprisingly well! Naturally not anywhere near the PSVR visual level but at like a tenth of the price I really can't complain. Can't wait to try out Mario and Zelda with this! And as my first labo kit, I must say I loved using the step by step instructions! Written and explained well, piece of cake to build. So with main unit having gyro isn't it in theory possible that if we solve the headstrap problem we can remove and hold the joycons in our hands? Is that enough for looking around in game like zelda? I guess it will depend on implementation. Nintendo can force controls to be attached, which would be a shame. The Switch tablet has an accelerometer and gyroscope built in. Have a PSVR but the surprisingly positive impressions + Zelda and Mario support convince me to pick up the starter pack. Mainly interested in the experimental minigames and garage mode as this freeform sandboxy stuff is something I currently don't get with PSVR (until Dreams hits). Nintendo have an excellent solution for this. Virtual Boy easter egg found. Fortunately these cardboard creations don't take up as much space as the ones from the other kits, so people will have an easier time here. I know the tablet gyro was a known thing, but I too found out for the first time when using the garage in the labo variety kit. I wonder if there will be an update to the robot kit to remake the visor into a VR setup, then at least you'd have a lot more motion spatial interaction. I ordered the starterset today for Mario and Zelda. Cannot wait! For some reason I thought this was coming out later in the month. Huh. Getting mine today! I'll probably only have time to build the goggles today though. I'm excited it seems to work well with glasses, because that's always been a problem in the (cheap) vr I've tried before. Anybody have any information about the lenses that are included in the kit? I'd like to see if I can find similar enough lenses to build my own headset. Do they look like fresnel lenses or are they simple biconvex lenses? The Mario and Zelda patches are later this month. Got the full kit arriving at my door any second now. Hopefully. Can anybody post a picture of Mario who supposedly appears in the VR videos ? They did say on the stream they initially thought it was a simultaneous release. They knew Labo vr was releasing today because of the review they were preparing. Do any of the reviews talk about how comfortable this is if you wear glasses? Won't be able to pick mine up until tomorrow but looking forward to the construction and playing around with the garage. My first set since the variety kit. I wear glasses, and the viewer is deep enough that there have been no problems so far. Great OT, I'm glad someone is picking up the slack for a cool new Labo release since my original OT is languishing in Hangouts Hell lol. Looking forward to trying this out later today. So is there any sort of strategy for sharing custom games? QR codes or anything? Seems like it’d be terrible to remake everything. Ah well. Great reviews. Looks like Ninty nailed the entry-level casual VR experience. Thanks for the impressions. How's the image quality in comparison to PSVR? Anyone know which retailers are selling the add ons? I can't find the elephant one anywhere locally. Thread title made my day, good job! Wow at the positive impressions in here. Looking forward to seeing what the Mario VR is like. Sigh of Relief post right here everyone. VR lives. the tap tap thing is pretty clever! Zoom in and screenshot your program in sections. Sync your Labo VR saves to the cloud and share your account password. Manually type out all the stuff you did. Those are the only solutions I can come up with off the top of my head, but not many great solutions it seems. I'm sure if a community is built around this, people can share easy to create functions to get a desired outcome with some clean code that makes it easier to recreate things. I basically plan to borrow from Nintendo's code a lot at first, if I probably could point people to code from other games to copy and paste from, rather than writing from scratch. As somebody, who owns a VIVE and tried different VR devices, i am surprised, that the VR experience of the Labo is actually passible. I didn't thought, that the image quality would be this acceptable. For people, who own a Switch and wanna try some okay VR experience, i would recommend Labo. But the problem may be the software. I didn't try all the games yet (i also didn't build the blaster) and there are so far just some very basic experiments. Not games or even mini-games. On the other hand it shows, that the creation tools look very promising. People dream of 3D Mario Maker and seeing the tool, i belive now, Nintendo could create a great and simple UI for something like this. VR Lobo is, like all the other version before, a learning and experiment set. So you have to make your own fun with it. In this regard, i would say it looks great so far.